Though the topic of promotion/relegation is the third rail of soccer discourse, it is worth considering in the context of the success of the NPSL North Conference teams. That success, along with the resulting marketplace currents, including the aggressive expansion of the United Premier Soccer League (UPSL) and the belief, born from the success of the North Conference teams, that running a lower division club is an achievable goal for lots of people, makes the discussion worthwile. There are various interests to consider: protecting what has already been built, elevating it to its peak, and opening a reasonable and affordable pathway forward for new clubs to join the league. The UPSL is now over 200 teams, more than twice as big as the NPSL, and it is still announcing new teams weekly. The expansion process seems to be guided by little more consideration than finding clubs that will pay. Just look at the expansion into Minnesota. The rot starts at the foundation, with woeful FC Minneapolis and overmatched Granite City FC able to muster a mere two wins and one draw between them this past summer. 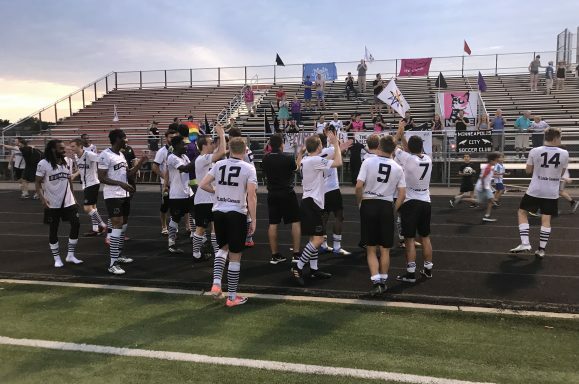 Those two wins were Granite City victories over FC Minneapolis, meaning that these two teams combined took a single point from 16 games against the rest of the conference. Two clubs from the Minnesota Amateur Soccer League (MASL) will join them in 2019. Division 1 mid-table team Vlora City were announced by the league. Division 4 side SC Saints, who played in the “Lions Cup” against Vlora City and FC Minneapolis a few weeks back, announced that they were joining UPSL, although the UPSL has not verified that. SC Saints finished 12th in MASL Division 4. Additionally, the UPSL announced Dakota Young Boyz, from Sioux Falls’ local amateur league, would also join the league. It is hard to shake the idea that the UPSL’s aim is to use the star dust of a national league to lure amateur clubs into joining despite, in the case of the Minnesota teams, a cost that is significantly higher ($2,000 per “season”, of which the UPSL has two per year, and a $500 per year administration charge) and a competitive level that is significantly lower overall than the MASL. Is there a club the UPSL won’t take? Can any of these clubs become serious clubs? That is where pro/rel could come in. Right now, the NPSL uses the entry free as a gatekeeping device. The entry fee does two things. First, it attracts the type of clubs that are serious and well-funded to afford their place in the league. Secondly, it deters the men’s league hopefuls.This system has hardly worked perfectly, though it is interesting to see how the quality of member organizations has increased along with the sticker price. The hard truth is that it is expensive to run a team at the NPSL level, and all the more so now because of the intense competition in the North Conference. Minneapolis City, who publish their yearly financials, provides a case study in what it takes to elevate from amateur league soccer, where they still operate teams under the Stegman’s umbrella in the MASL and MRSL. In 2016, when they played in the Premier League of America, which merged into the UPSL last year, they operated on an approximately $30,000 budget. In 2017, their first year in the NPSL, they spent approximately $46,000. This year, according to club President Dan Hoedeman, they will spend over $85,000 running the club. While they get heat as ‘the Yankees of soccer’ from elements to the north (though Duluth and Med City can’t be far behind, if they even are, in spending), they are a club that does not recruit or house out of state players. They travel in vans, not coach buses. They have no employees. This is a club that works hard to keep its costs low. It is simply that expensive to run a quality NPSL club. The pro/rel opportunity of an NPSL 2 would give nascent clubs an opportunity to get their operational gears turning and demonstrate a financial and on-field model that works. As an approach, it is not dissimilar from what Minneapolis City did with the PLA and Duluth and Dakota Fusion did with their year in the now defunct American Premier League. These clubs played a season outside the NPSL before making the step up. With pro/rel in place, instead of the criteria being ability to pay the entry free, the criteria would be sporting merit. To ensure stability clubs should be able to decline a promotion, or have it blocked, as happens in the European leagues, if they are unable to meet NPSL minimum standards. Those standards should include a financial health test and a performance bond. Because the step up to running a professional team is so high, let’s focus on amateur soccer and extending upon what is already in place in the NPSL North Conference. 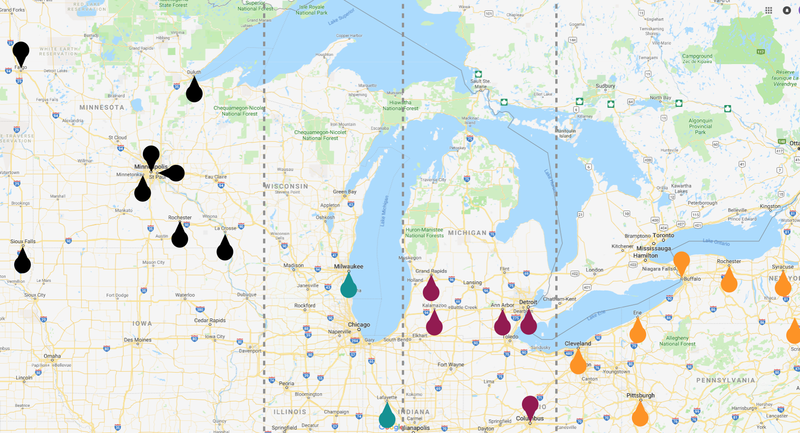 Currently, the NPSL Midwest Region is divided into three conferences across a large part of the country. The NPSL Midwest Region clubs as of the end of the 2018 season. The big opportunity, clearly noticeable from a look at the map, is to grow the Midwest Region into four conferences. Each conference would be anchored by a major metropolitan area or would be areas with the boundaries drawn to manage travel as much as possible. The clubs on the peripheries are never going to have great travel options, but travel challenges can be minimized. There is currently a big hole in Wisconsin and Illinois. Delving into the possibilities and opportunities there is a separate article, but suffice to say there are quality clubs in those areas that should be looking at ways to create a conference for themselves like the North Conference teams did in 2017. The focus for this article, though, is on that North Conference. Right now, it makes a lot of sense geographically, one reason why the conference has been stable relative to the rest of lower division soccer. There are still a lot of open spaces on the map. 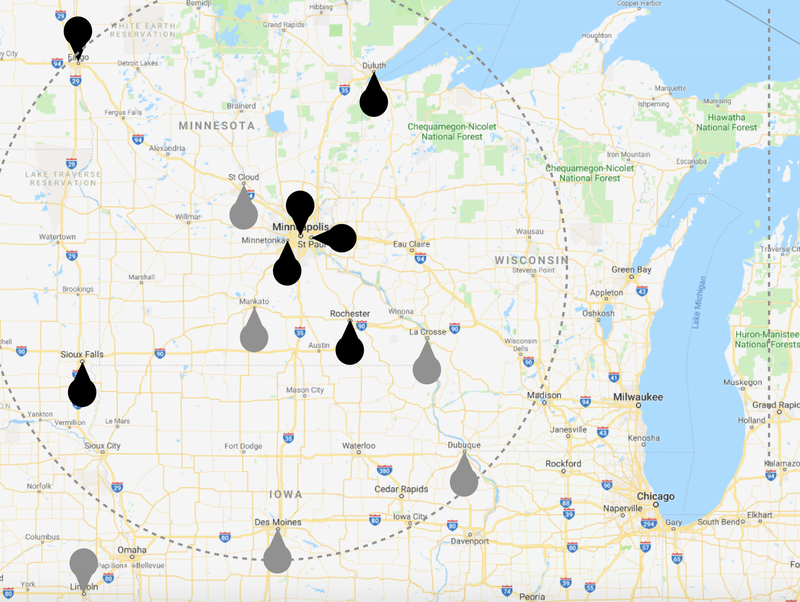 The current location of NPSL North Conference teams with the circle denoting drives approximately 4 hours from a Twin Cities centerpoint. As a first step to instituting promotion and relegation, and in a nod to the short summer season, NPSL Midwest conferences will be capped at seven teams. That means that La Crosse Aris will be the first team relegated to the NPSL 2 North Conference. It also means that Aris will start the season with a realistic chance at winning a game for the first time in years, a feat which could breathe new life into the organization. Black markers indicate proposed NPSL 1 clubs and gray markers indicate proposed NPSL 2 clubs. The trip from St. Cloud to Lincoln would not be short. Google says that it is a 7 hour drive. Some owners might argue that it is in the interests of the clubs, especially NPSL 2 clubs, to shorten the geographic boundaries. However, there are already competitive local amateur leagues that these clubs can join if they do not want to travel. The entire point of a league like the NPSL is to provide regional competition for clubs and players that have what it takes. 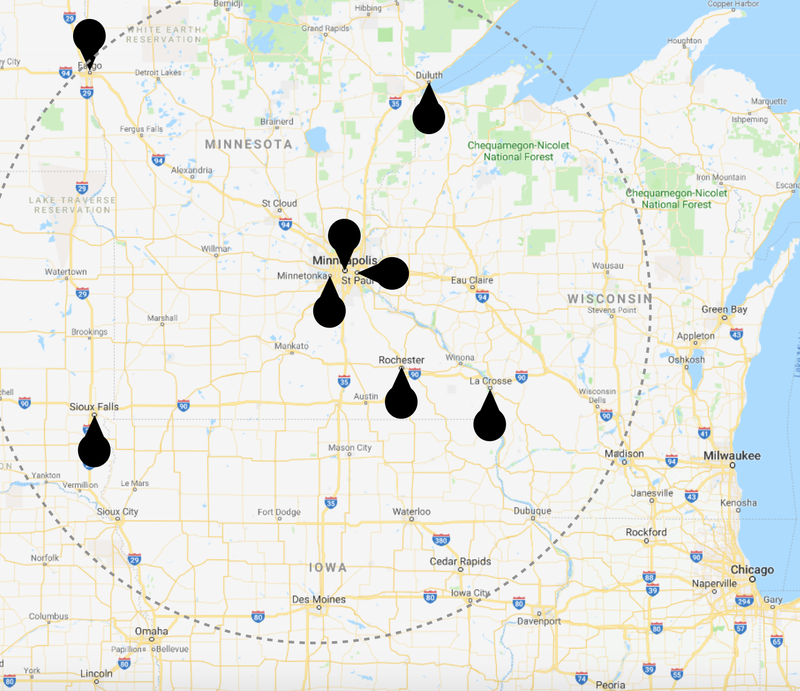 The way this region is drawn, the maximum travel possible among all of the teams would be the eight+ hour drives between Dakota Fusion and Union Dubuque and Duluth FC and Nebraska Bugeaters. Those are long trips, but not impossible nor an unreasonable ask of a regional league. The implementation of pro/rel does introduce some variability to the make-up of each division, which introduces some risk. And yet, so does the potential of traveling for the NPSL playoffs. The trick is limiting the variability, which this geographic range does. The promotion/relegation mechanism would be simple and limited: the top team from NPSL 2 North goes up and the bottom team from NPSL 1 North goes down. Then, for a little excitement, while the top two NPSL 1 North teams are in the playoffs, the NPSL 2 North second placed club would face off in a two-legged playoff against the sixth placed NPSL 1 North club with the winner getting the spot in the next year’s NPSL 1 North Conference. The minimum requirements and league fees for the NPSL 1 clubs would be the same as they already are. They would be eased slightly for NPSL 2 clubs, though the expectation would be that NPSL 2 clubs would be working to meet NPSL 1 standards off the field as hard as they are trying to reach them on the field. The league would not be completely open. It cannot be. There has to be some level of gatekeeping to ensure that viable, sustainable clubs are able to put out a competitive team, attract clubs that can market themselves and draw fans, and, ultimately, get to a place where all member clubs are partners in creating a league with meaningful fan interest. This is about elevating the lower division game in America, not about dragging it into a glorified men’s league. The truth is the top teams in the NPSL North Conference put out a great on-field product, far better than most people expect. At the same time, the off-field product is fun in a minor league way. It has taken a lot of money and effort to get this far. Pro/rel can add to this progress as long as there are guides in place to make sure that it does not introduce wild expansion, creating a revolving door of teams entering the league and then folding, or of teams unable to complete the season. That means, as much as it may offend open system purists, that there need to be clear, enforced minimum standards, a performance bond, and application with marketing and staffing plan, and a financial test. In the interest of stability, I might even demand a multi-year commitment from teams and use the performance bond to enforce that. So, while I would do away with the expansion fee, I would still demand a large sum of money upfront to make sure that only serious clubs apply. Also, in this early incubation period, I would create a level of geographic exclusivity for a set, short term. Having seen what Dakota Fusion did to FC Fargo, and having heard that Dakota Fusion averaged a mere 75 fans this season, a better approach would have been to give FC Fargo a four year window of exclusivity to give them a fair shot at establishing themselves. This is important, and doing things to increase the longevity of clubs and reduce churn within leagues is a lesson that we should have learned from the original NASL, but apparently have to learn over and over again in American soccer. While the window of exclusivity is not a guarantee of success, it is a guarantee that the league will be a partner in each club’s attempts at success. It also helps keep the league from turning into a glorified local league or from cannibalizing the local leagues. There are storied and competitive amateur leagues all over the place and pro/rel should not aim to replace them. The point is not to reach into the state league ranks. The point is to create an ecosystem that drives interest and helps clubs that want to play at the regional level. Are there enough clubs interested in NPSL 2 to make it work? It is hard to tell. There is a lot of pride, a lot of ego, and a lot of do-it-myself in the lower divisions, which is why they are so splintered. Would any UPSL teams switch to NPSL if they had to start in NPSL 2? They should, but a rational should does not always overcome emotional resistance. In other words, it is fun to think about but is definitely a long shot.